Consider the benefits of owning furniture from Element Square. Made from premium marine grade polymer and designed to be left outdoors year-round, Element Square furniture is designed to provide you with years of worry free enjoyment. No maintenance required. 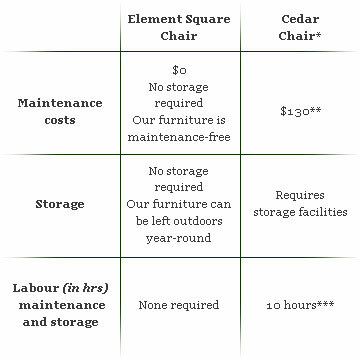 Compare the costs and time associated with owning a piece of furniture from Element Square versus a traditional cedar chair. ***includes preparation, sanding and staining (3 coats) and travel time to move chairs to storage each year. Does not include the 24 hours of drying time between coats.